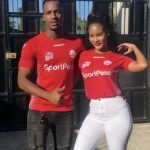 Hamisa Mobetto might be facing serious charges if the accusations placed against her by her ex boyfriend’s wife are true. Yesterday evening Tasha Dolly who is said to be the husband of the new man Hamisa Mobetto was seeing; came out to say that she had been beaten by some goons hired by the Tanzanian socialite. According to Tasha, she has already got a p3 and if anything happens to her unborn baby Hamisa Mobetto would be responsible. She went on to add that if her husband is the reason she is getting attacked; then she is ready to give him up. Hamisa husband snatcher Well, for a while now Hamisa Mobetto has been accused of taking people’s husbands. First she got involved with Diamond Platnumz while he was dating Zari and now her current ex boyfriend is said to be somebody’s husband. His wife, Tasha has one child and another one on the way! The post Hamisa Mobetto allegedly hires goons to beat up her ex boyfriend’s pregnant wife appeared first on Ghafla! Kenya.